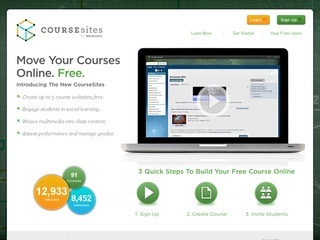 CourseSites is a Learning Management System flagship product powered by Blackboard. CourseSites allows instructors and teachers to decide curriculum and setup personal teaching classrooms. Today, there are over 74,200 instructors meeting the requirements of 12,573 institutions spread across 159 countries, all thanks to CourseSites. CourseSites is a free, hosted online course creation and facilitation service that empowers individual K–12 teachers, college and university instructors and community educators to add a web–based component to their courses, or even host an entire course on the Internet. GTC student teachers are given the opportunity to learn how to use this powerful tool as part of their class work. Please note that if you manually add a co-instructor to your course they will NOT receive the link, from the Office of the Provost, to the end-of-semester evaluation. When an instructor is officially assigned to teach a course, that instructor is automatically added to that Blackboard course.